Some things in life are better left to the senses than to the analytical brain. Last Sunday’s L.A. Phil concert was such a sensory multimedia experience. The program started with J.S. Bach’s Ricercata from The Musical Offering, BWV 1079, in Anton Webern’s hallucinatorily beautiful orchestration, in a sensitive and sensible reading by L.A. Phil’s new Principal Guest Conductor Susanna Mälkki. The next work, by another serialist Bernd Alois Zimmermann, was a hybrid Cello Concerto and ballet (en forme de pas de trois). Without delving into the composer’s manic-depressive personal life and hearing the music strictly on its own merit, the concerto played out like a haunting fairy tale fantasy with descriptive titles such as ‘Three White Swans’, ‘Three Knights’, ‘Don Quichotte’ and ‘The Fairies’. 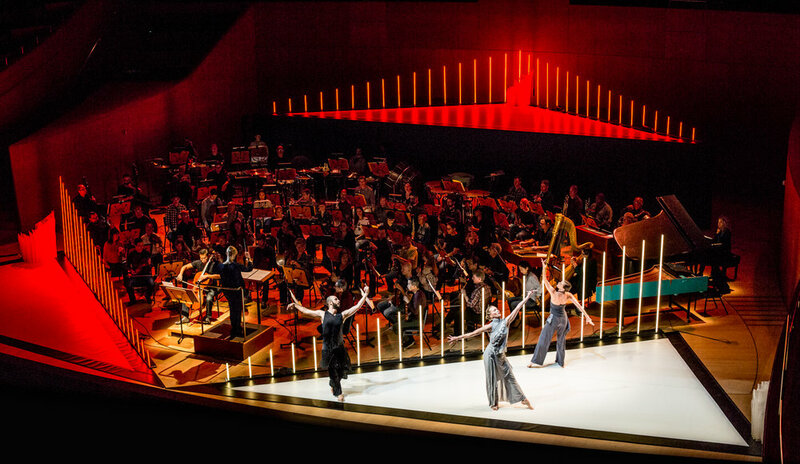 Mikki Kunttu’s set design created a veritable light show with a ring of LED light poles and the orchestra in its center. The original soloist Robert DeMaine bowed out due to “the highly complex nature of the work” and his shoe was filled by three excellent cellists (Ben Hong, Eric Byers, Timothy Loo) playing the various sections. The three virtuoso dancers were from Finland’s Tero Saarinen Company, and created mesmerizing synergistic physical counterpart to the music. Not your typical classic ballet, the highly stylized dance movements looked like a mixture of bunny hops and martial arts. That maestro Mälkki was able to beat time and conduct this seemingly random work was a minor miracle in itself. The final sensory experience on the program was the most conventional, and the most highly charged to the point of sensory overload. There is a reason Strauss’ Alpine Symphony does not get played often, not the least because of its humongous forces required – 150 musicians, including a heckelphone, cowbell, thunder machine, wind machine, celesta and, last but not least, 16 horns. In the vivid reading by Mälkki, the hills and the Alpine ‘flowering meadows’ were alive with the sound of cowbells and burbling streams, and reaching the summit was as exciting as the night storm was ferocious. One was glad to see the L.A Phil musicians in the new year at the summit of their capabilities, and sad to see a few familiar faces gone (violist Carrie Dennis and oboist Ariana Ghez).